THE #1 source for part and information to Camaro Berlinetta Owners for over 20 years !!! ----> Unlike many other Camaro web sites; this one will focus on one type of Third Generation Camaro; the Chevrolet Camaro Berlinetta ! The Berlinetta was originally introduced with a second generation body-style in 1979 and was produced until mid-year of 1986. Chevrolet already dominated in the performance market with the Z28 at that time & decided to target the luxury market with the Berlinetta by installing an upgrade interior, complete gauge package, smooth riding suspension, and a long list of option codes inside of these unique Third Generation Camaro cars. ----> The 'Starship Camaro' Berlinetta was only offered during the 1984, 1985, & 1986 model years. It's concept was initially developed by A GM designer named Nelly Toledo in 1981 and included specially designed telescoping Control Pods & a free standing, rotating, Cassette Player with Equalizer Stereo system. This cockpit design was radical at the time and achieved it's purpose of merging the latest digital technology with aero-space inspired ergonomic controls. A Camaro Berlinetta has many hidden features that were years ahead of it's time that most *Regular* Camaro owners never got the chance to experience in their "regular" Thirdgens !! ----> Thanx for Stopping By ! Wow - Another year gone by ! I've been introduced to a lot of other Berlinetta owners and have been in contact with many of this sites past visitors this year. In some cases there were simply question and answer type messages, some just to stay in touch and keep current, and some folks with major issues that needed a lot of help to get past. As always; I enjoy being able to help people by passing along my previous experiences and feel great satisfaction when I can provide people with the parts that they need to get their Berlinettas Back In Action ! Mean Green is still in deep hibernation and will remain asleep in my garage until the Winter weather turns to Spring. I'm hoping to be able to update the front end / nose of my Berlinetta this season by finally re-painting the 'nose pockets' back to black again. It's something I've been meaning to do but HAD to focus on other things when I was healthy enough to do any real work. ( Bad knee, been a problem for awhile now ) I've got a couple other 'little things' I need to do like some new rear brake pads, re-adjusting the E-Brake and other minor repairs to make, but I'm expecting to do more driving than wrenching on the car again this year. Hope to see you fellow gear-heads on the open road !! It's been awhile since I've made any significant changes to this website but I continue to receive and reply to incoming E-Mails on a regular basis. While I am not able to respond to everyone on a daily basis like I used to,..... I still spend countless hours into replying to requests for parts and information every week. Please understand that I do not get paid for the time I put into helping you & I get a lot of E-Mail ! It's not always easy for me to respond right away ----> so please be patient ! Mean Green (my 84 Camaro Berlinetta) is in great shape and treating me really well. There have been very few modifications in the couple years so I've been able to enjoy more time behind the wheel and less time under the hood ! Like all of you; I CAN'T WAIT for Springtime 2017 ! The most recent upgrades I've made to my Berlinetta are interior modifications, the most significant was updating the custom BOSE audio sound system. I've added a new Signal Converter and replaced almost all of the BOSE amps. Half of them were rebuild/restored original parts and the other 1/2 of the AMPs were removed so that newer ( & more powerful ) units could be installed in their place. Sadly; My Digital Dash GTA restoration is STILL mostly on hold. While I have completed all the mechanical rebuilding work, I'll need to refinish most of the suspension before I can get to body/paint prep. Some health problems during the last 2 summers has caused a HUGE delay in most of the work I had planned so I've got to stay healthy this year so that I can get that project back-on-track ! Boy - It's been a LONG time since I've updated this Home Page !! Hopefully the lack of any recent updates hasn't made folks think I've given up on the Third Generation Camaros' most unique offspring ! The last couple years have been a little 'slower' for me the previous when it comes to my Camaro/Firebird projects because of shifting priorities, ( home repair, weather damage, growing boys, family responsibilities, ect... ) But I will always remain very involved in helping to provide information, assistance & restoration parts to other Third Generation F-Body fanatics ! My Berlinetta is ready and waiting (Like all of us here in the North-East) for Spring to finally arrive. Temps are running about 15 degrees below average so far this year and we all REALLY deserve a sunny & warm Summer of 2015 to compensate us for the horrible Winter 2014-15 ! My garage is not heated so I've been pretty slow to get "started" on any significant work so far this year. ( My FIRST task is to remove/rebuild the 4L60E that died in my Trailblazer - GOT to have a truck !! ) Sadly; My 88 Digital Dash GTA restoration project has been put on hold ( again) so that I can address some major restoration work needed to my home. I'm doubtful the GTA will get painted this year, but with any luck I can at least get the metal work done and the body ready for paint before this season ends. I have just about everything prepared to rebuild this car, new seals, rebuild engine, new suspension, rear end restored, brakes completely rebuilt, all good interior parts acquired & so on,...... just need the car to get a few dings/dents removed and then paint it so I can put it all back together ! I am now testing Camaro Berlinetta Electronics for Berlinetta Owners in need. This Testing Service is very inexpensive & allows people to know exactly what is and isn't wrong so that people don't have to spend hundreds of dollars to have a local shop try attempt to try & figure out what is wrong with their Berlinetta. It also allows people to make sound decisions on exactly what part(s) need to be replaced BEFORE you buy the wrong part !! Most mechanics simply do not have a clue how to diagnose the complex Berlinetta electrical system and often pass BAD information to people after a 2 minute evaluation. ( or have the car for weeks on end while they try to figure it out & charging ridiculous diagnosis fees. ) My Testing Service will positively identify ANY problem in ANY Berlinetta part that I test... NO MORE GUESSING which part you need to replace !! Disclaimer !!! 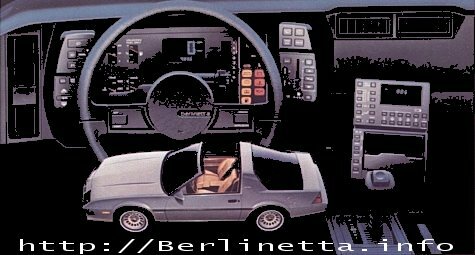 The this site continues to slowly grow into the most complete source for Camaro Berlinetta information on the WEB. Understand that I am only human and there will be a number of corrections that will need to be made to this site as it grows. I make every attempt to report only facts on this website and in my private E-Mails. So feel free to E-Mail me any questions or comments that you may have !!!! I'll W/B ASAP !